Eggs in a basket can be used as a high-energy warm-up that requires agility. A good lead–in to fielding games. Mark out an area with 4 cones and place all balls in the centre. Players line up behind each cone. 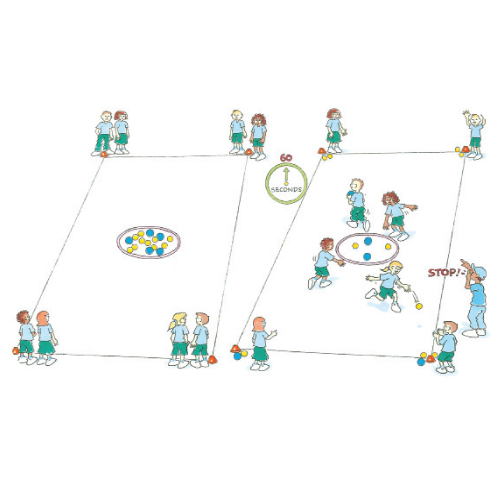 On a signal, the first person from each team runs to the centre and picks up a ball to throw to the next person in line. Once the ball is caught and placed beside the team, the catcher runs to the centre repeating the process until all the balls are gone. The aim is to be the first team that retrieves the most balls.